I love smiling, it's my favorite. The holiday season is upon us and despite recent research by the NRF showing consumers plan to cut back on “self-gifting,” new findings from our 2013 Holiday Shopping report show nearly 80% of women intend to purchase holiday gifts for themselves this year. The one-for-you-one-for-me method of holiday shopping lives on! 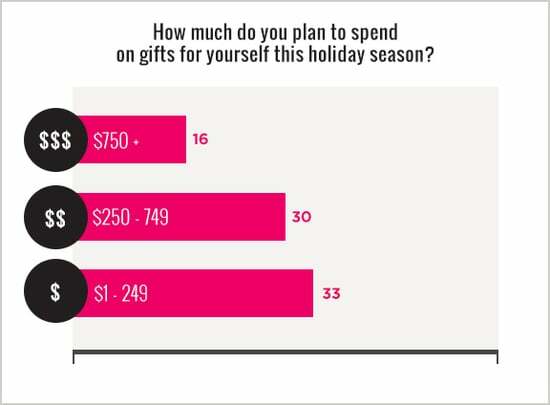 We asked women how much they planned to spend on gifts for themselves and an astounding 33% indicated that they intended to spend between $1 - 249, while 30% planned to spend between $250 - 749, and 16% anticipated spending over $750 — happy holidays, indeed. Next, we asked women to detail the items on the top of their holiday wish list. Not surprisingly consumer electronics, specifically Apple’s new iPhone 5S and iPad Air were frequently mentioned, as were apparel and accessories like boots, handbags, and purses — because if you get a new iPad Air you obviously need a new bag to carry it in. Luxury brands like Chanel, Burberry, Prada, and Marc Jacobs also topped the list of must-have items. Digging deeper into shopping bags we also uncovered 39% of women ages 18 - 34 plan on spending between $100 - 499 on gifts for themselves, while women over the age of 35 are more likely to spend over $1,000 on gifts for themselves. The takeaway from all of this? Marketers shouldn’t forget that despite economic uncertainty, certain segments of women still plan to purchase for themselves this holiday. Planning is key to capitalizing on this merry group of women. Marketers should reward these women for their desire to purchase by suggesting products that wouldn't normally be purchased throughout the year — who can say no to fur lined booties and cashmere sweaters when they're perfectly priced and just the right size?